Create a hard case for the Samsung Galaxy S4. Make it personalised with a custom design or photo. Keep your phone safe with a unique case. Our Full wrap cases our one of a kind! A full wrap case from GoCustomized is not just any old case. Your design will be printed on the entire case. This means that not only will the back be covered in your self made design, but also the sides. This gives you the opportunity to make unique designs that incorporate the sides of your case. Think about cool frames to place around your chosen picture. 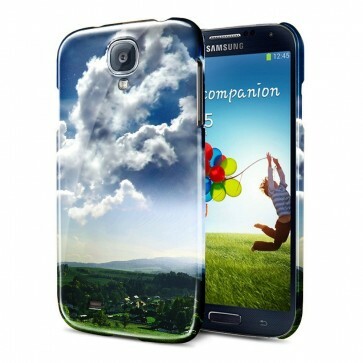 In addition to being a unique stylish accessory, the Samsung Galaxy S4 full wrap case from GoCustomized offers much needed protection for your phone. The sides and back of your S4 will be well protected from scratches and dents. What do I need to do to make the perfect cae? Very simple. Upload one of your favourite pictures to our design module to get started. Think about your honeymoon picture, your favourite holiday photo or a picture of your loving pet that you have to leave home alone each day. Anything is possible and its all up to you. You can also add a nice quote or personal text using our text module. There are plenty of fonts and colours to choose from. Finished? Good. Order away so we can get started making your own of a kind Samsung Galaxy S4 full wrap case. Happy with your design, then let us get started? Once you have submitted your design, we will get stared making your case stragith away. We ensure that your case will be shipped within 24 hours if purchase. You dont have to stay home to receive your case, our packages fit right through the mail box. If you are unhappy with the end result, get in touch with us straight away so we can offer a fitting solution!